The Chamber emphasizes the link between responsible public spending and just compensation for our public officers, by the absolute need to provide an improved oversight to public finances. We have called and continue to call for the appointment of the 13th senator and a more autonomous PAC, both of which would go a long way toward ensuring stronger independent reporting and oversight of the nation’s public spending. Today thousands of primary and secondary scholars got a holiday, as their teachers took a day off to rally for a buffet of social causes, but mostly their own: they are demanding a raise, which they'll get, but they're also demanding that the Prime Minister commit to a minimum increase, which he has refused to do. So, they're throwing that on the fire, along with many other issues that are out there, to strike up the most organized union machinery in the country. Approximately 350 teachers moved off from Constitution Park at around 8:30 this morning, ready for the day's rally, taking over Cemetery Road, and the main downtown area, and by the time they got to the Battlefield Park, the stragglers who arrived late boosted the numbers to about 410. That's the figure that we counted, but the figures from the BNTU is that was actually 575. We didn't see that extra one hundred and 50 in the march, but admittedly, there were some teachers who were already at the Park waiting for the rally to start. "The person I had counting told me 475 and with the ones that were added in there was almost 500." "In total, how many teachers are?" "I have 675 teachers and then I have a few more that make retired teachers that take us to 720." But in the Belize District, estimates say that there are seventeen hundred teachers, so even by their count, just under two thirds didn't show up. "BNTU Belize branch invited the teachers out. An invitation can be honored and it can be turned down, so we are just taking it to mean that those who didn't come didn't accept the invitation to be a part of the process that we have started here." "Do you look at it as some teachers fighting another just laying back waiting for the sweets to come in?" "That's the nature of unionism, there are teachers who sit by and they are the ones that will take it as the freeloaders; they will take on the gains from the fight of the union activist." The leaders of the BNTU understand that this is one of the downfalls to unionism, but even without the numbers on the ground, the rally was filled with energy, loud enough to disrupt the normal flow in the downtown area. "I see some people out here in green and I am quite sure that one or two persons that I see out here in green are working with the police department, so even the police is on our side. Even the police is with us." "Tuesday Ramen Shrimp, Wednesday Ramen Beef, Thursday Ramen Oriental, Friday Ramen Hot and Spicy - we have been living like this for quite some time. We have been forced to live on Ramen while our leaders and colleagues get to fly away on jumbo jet and go to fancy restaurants and they get government issued vehicle that are Hummer 2012 and 2014. They get to live in houses and they ge to proclaimed to the nation that they are not normal Belizeans. Let's not forget when we see ministers that when they were campaigning used to ride on bikes, but now they have many huge structures that are yellow and bright." "I believe that the teachers got the back of the Belizean people because you are showing it today. You are showing it today despite the attempt at intimidation by the Minister of Education, despite the attempts by some of our principals, despite the intimidation by some of our managers." This rally, like the other 2 in the north, is being dubbed a call to action on all issues of national importance, but once again, a great deal of time was spent addressing the salary adjustment which is still pending. "Brothers and sisters here we are talking bread and butter issue. The only persons that have gotten a raise in this country since 2005 are the ministers of government because you remember they were in opposition, so their salary was smaller. We have not gotten a salary adjustment since 2005 and therefore we stand up today in solidarity and we want to send a message loud and clear to the Minister of Education to try and stop this scare tactics because he cannot scare the teachers because we teachers build this nation." "Our salary is getting very low. We as teachers they don't know what we are doing in that classroom, we help those kids. Some of them come hungry and we feed them, we give them supplies and we also put back some of our salaries into the classroom." "The cost of living is way up right now and the teachers really need their raise and as well I agree that if we get injury on the job, that Social Security should cover us there and I am against all the corruption that is happening right now, so I am out here for all these reasons." "So, this is just more than a salary adjustment?" "Of course it's just more than that." "It's not only salary adjustment; it is a matter of our national dignity and pride. Yes there are one and two little issues like the floor but we will stick to our position. The main issues are from way back and even in the BNTU constitution, we need to fight for social justice." "COLA support the teachers in that they deserve a raise. The cost of living has sky rocketed, but we will even go further; everybody deserve a raise. The minimum wage needs to raise up. This is ridiculous, the cost of living has sky rocketed and people can no longer survived on this small pay." A number of schools in Belize City didn't have regular classes because of this rally, a free holiday despite the continued heavy criticism the teachers get, they shrug them off.?? "Another point we need to clear up brothers and sisters - when the minister gets on the radio again and speaks of why don't we do this on a Saturday, well I want to know how effective or how stupid we would have been because that is what he is trying to tell us; be some fools to carry a rally on a Saturday and it wouldn't affect anybody. We will affect him from now until we get what we want, that is what we are about. We do not ask permission when we are battle ready. We are going to do what we have to do because we believe in what we are doing." Yesterday, at the bike rally, there was a great opportunity to show the public that the teachers are willing to move at any time for the cause they believe in, even if it was on their own time, and even if caused any inconvenience to them. That would have laid to rest any lingering doubt about their commitment. This media house thought it was a matter for fair comment, but the BNTU President clearly didn't think so. "Unfortunately for Channel 7, you people always want to give a twist to something. The issue here is not whether the teachers wanted to come out in the afternoon after class or whether they want to come out on a school day. The Belize branch organized something for whatever reason it did not work out, I cannot answer that, but the bottom-line remains still that there were 3 brave teachers who decided to carry out what their branch had agreed to do." The President also wants it abundantly clear that these rallies have no political influence. "The unions have been clamoring for these changes for years, so let nobody tries and trivialize, let no nobody try and skew, let nobody try and get you to change your mind to believe that we are dealing with politics. The only P we are dealing with out here my brothers and sisters is "pay" - that is the P that we are dealing with out here." "We choose the color green because they have to see what we mean and we address to Mister Dean, I feel like I will get into problems, but I don't mind because teachers..."
The BNTU takes the rally to the Cayo District next week, and on January 31, they end off in the Stann Creek and Toledo Districts. "In Orange Walk, the rallies got started at around 9 with the parade and so on, and by midday, everything was locked down, you know, and teachers were all over doing business. And so, the entire afternoon was wasted, Mr. Speaker. In Corozal, the rally was held in the afternoon, and so, the entire morning was wasted, if anybody doubts that look at what happened in Belize City, where the rally got finished by 12 o'clock, and the entire afternoon was lost. What prevents them, Mr. Speaker, from having these rallies - there is one scheduled for this Friday, I am told, in Cayo - what prevents them from starting that rally at 2 o'clock, and dismissing school at 1 o'clock, if we are really concerned about the students. In Belize City, Belize District Mr. Speaker, where there are 1,700 teachers, they could have only mustered 400 or 500 to go to the rally? That means that 1,200 teachers, Mr. Speaker, did not go, and I don't want credit for all of them who didn't go. We'll take 500 out of that; 500 did not go because they knew the benefits that they have received under this administration. So, the rallies continue. I make the appeal for teachers not to go; I make the appeal to teachers to go to their classrooms. So, I make the appeal to them to be reasonable, Mr. Speaker, to be reasonable and to get back to work. Next week Friday, it's pay day, and if teachers in the Stann Creek District are famous for breaching the policy; many of them, breaching the policy of the Ministry when they know that they should not be taking that time off. So, pay day for them is Friday, and it's already a holiday, even though the Ministry says it shouldn't happen. We will be cracking down on that. But, so because they already get that day off normally - yes, because it's wrong; the children deserve the best. The children deserve maximum hours in the classroom, especially in light of the fact that we're not doing well on these examinations. Well, they've decided that they will not have the rally on Friday, because they would already gotten that off, and of course, that would have been an inconvenience to them because it's payday. So, they will do the rally on Thursday." And as if taking on the teachers wasn’t enough, Faber also had some choice words for the Chamber of Commerce. As we’ve reported, that group issued an unexpected statement last week saying that it quote, “supports the Teachers in their demand for a wage adjustment that better reflects the increased cost of living experienced by all Belizeans…” End quote. "The Chamber, Mr. Speaker, put out a release that I don't understand. I think it baffles me. They're saying that the teachers deserve a raise, and they support the teachers getting a raise. I find it strange that they would say to the Government that you can give this raise if better manage yourself, and if you give the raise because there is this cost-of-living adjustment that is needed. Give the raise. Well, Mr. Speaker, if they are going to ask for a raise for the public servants, I am going to ask for a raise for the private sector, all the workers who work out there, Mr. Speaker. If they think that the Government can afford a raise for the public servants, then why is it that they can't afford to raise the minimum wage, and raise the salaries of all the other Belizeans who are not working in the public sector. Let's have that discussion. But you see, Mr. Speaker, they don't want to have that discussion. When we have that discussion, there will be problems. They don't want these people to get a raise. Well, if there is such a cost-of-living adjustment that's needed, give those people a raise too. Let's talk about how we can raise the minimum wage, and even if you don't raise your minimum wage, get your businesses to hike up the pay these individuals. And I am saying, that if they are serious about giving the people a break, they will be riding those merchants who come under their watch, even if they are members or not. I don't see them championing the cause of taking down the price of goods. And we know Mr. Speaker. I am going to go out on a limb to say that the merchants of this country, some of them are good, but a lot of them continue to fleece the Belizean nation by charging a whole of fees and so on on the goods." "I called for Luke Palacio certainly an hour before that to say to him, look, I've seen - this is an honest mistake. I didn't get him, and then, when I called again, I left a voicemail, not saying that I am calling for you. I am calling for you, sir, to make clear that when I said August in the New Year’s Message, I misspoke. It is July, the records are quite clear, and July it will be. I believe he may have confessed to having gotten the voicemail, but he didn't say if the voicemail clarified, if he wanted clarification, the fact that this was an honest mistake. So, I have to say that there is a degree of bad faith on his part to use that an excuse. Now when they don't have ball, they only look on eyeball. But remember the old saw, whenever somebody says that it's not about the money, it's about the money." The teachers union will hold its next rally on Friday in the Cayo District. The Chamber has heard Hon. Patrick Faber’s comments in the House yesterday and is compelled to clarify our press release of January 17, 2014. In that release, we advocated for a phased-in approach to increases in teacher’s wages, based on responsible financial management principles. Belize has excellent teachers, mediocre teachers, and teachers who should seek another profession. The object of a merit-based increase is to motivate our teachers to consistently improve, which will only serve to better our country and our future generations. In these times of widespread poverty and illiteracy, we can no longer afford to skimp on education. This is why the Chamber, in supporting the teachers' request for a wage increase, and being mindful of the limitations of the public purse, suggested that any increase be phased in over a number of years, and must be merit-based. Hon. Faber has severely criticized the Chamber for daring to support the teachers in their demand for a wage increase. We find this alarming in a constitutional democracy which should encourage freedom of speech. Hon. Faber has also publicly accused the private sector as a group of underpaying its employees while overcharging the public. Aside from noting the evils of generalizing, whether it be about politicians, public servants, or the private sector, our response is that businesses that are good corporate citizens pay a disproportionate amount of taxes, leaving a diminished amount of resources with which to create jobs and pay employees. In addition, those disproportionate taxes cause the citizens of Belize to pay higher prices on goods and services because they directly and severely impact the cost of doing business. We do not speak for those businesses that are not good corporate citizens, and welcome any effort the government wishes to make to ensure that those businesses pay their fair share. As the largest taxpaying body in Belize, the private sector contributes the majority of the government’s wage bill through the aforementioned disproportionate taxes. We therefore cannot support the notion of an across-the-board public sector wage increase, but we do reiterate that good performance must be rewarded if we are to continue to see improved performance. Further, as the largest taxpaying body in Belize, we also object to the notion that government ministers can treat statutory bodies within their portfolios as though they are their own private businesses. The suggestion of ignorance is no justification for the inappropriate actions of both ministers and the board governing the statutory body, both of which in our view, have a fiduciary responsibility to protect the public purse. If our economy is to improve, sound financial practices and the most transparent of good governance must be applied. The private sector, in its struggle to bear the burden of business costs, demands that the government apply those principles, including anti-corruption laws and rules defining and preventing conflict of interest. Taxes must be paid, and in return for paying them we justifiably expect that the resultant revenue be carefully managed. Attempts by a Minister to insult and threaten the largest taxpaying group in the country because he had not carefully read our press release is certainly not the wisest course of action for healthy partnership and development. In the 33rd year of our independence, we can and must do better as a country. 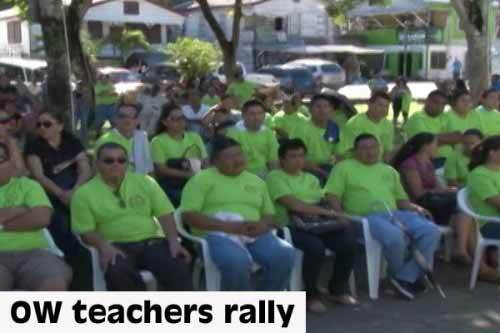 The Belize National Teachers Union's month of rallies continued today in the Cayo District. The country's most powerful union has done the north and center of the country, and today they moved west where the union branches of Benque, San Ignacio and are Belmopan are known to be well organized. But then, it rained...as Jules Vasquez that didn't stop a spirited rally:..
Umbrellas set the tone this morning in the Macal River Park where a steady drizzle forced a late start. An observer might have been led to conclude that there would be a poor turnout but the teachers kept streaming in in their neon green shirts and their carefully composed signs - designed for maximum insulting effect to the Minister of Education. "Minister Faber has to grow up "Patrick, you are a boy to us, you are a little boy to us." Monday we are to meet and Patrick you better put on your girdle and come straight." "I find it utterly and completely distasteful and I think the Airports Authority and the minister are both wrong. So don't think I am here making any apology for anybody, but call it what it is man. It is not corruption." "Yes it could be distasteful and wrong, maybe its two different thing but it's not corruption." "Distasteful and wrong doing and error of judgment, a bad decision, a wrong doing and we can go on with such other terms. So then I can say we are not absent from school teachers. We are attending a professional development exercise." "And then we still have the man walk in the House of Representative represents us with a big long neck with everybody to see. Corruption, distasteful and wrong but it's not corruption." "We will not be intimated neither by Patrick Faber nor the government of Belize nor any other person who believes that they have power. The power is in our hands. We do not need any permission to have a rally, we've inform them that we are going to rally and rally we will until the end of this month." "Just a while ago, not even half hour ago we got a phone call, the Prime Minister wants to meet with us. I don't know about what, but when the heat the come on and under fire, let his meet with Patrick and tell him to behave himself little boy." And that defiant, entitled cool is the mood they took into the streets of San Ignacio for a march that saw about 450 teachers take to the pavement. Again, here on the streets, it was super peaceful - more procession than march, they walked in three's, sang their union songs, no naked hostility, no rage, as if seeming to say that their numbers speak for themselves. And while the teachers had good numbers - we note for the record that there are 1300 teachers in the Cayo district - and a little less than half about 550 of those showed up. Additionally, there was to have been a simultaneous Town shut down organized by the Cayo Citizens Against Crime - but that totally flopped, as we didn't see any businesses closed. Next week, the rally moves to the Stann creek District, where, the Minister of Education laments it will be on a Thursday, to accommodate school teachers who say they need the Friday off to cash their cheques. For Stann Creek school-kids, that means a 3 day school-week - which will surely give them reason to rally. Later on, we'll have a little more from today's rally, where President Luke Palacio explains what happened to that voicemail he got from the Prime Minister three weeks ago. If you watched the news on Friday - you'll recall the angry, bitter and just downright mean words that BNTU senior advisor George Fraser had for education minister Patrick Faber. And if you missed it, the Prime Minister didn't. He certainly listened to this line:..
"Just a while ago, not even half hour ago we got a phone call, the Prime Minister wants to meet with us. I don't know about what, but when the heat di come on and they deh under fire, let him meet with Patrick and tell him to behave himself, little boy." So, from that you'd conclude that the PM hurriedly called for a meeting because, in Fraser's words, he was "feeling the heat." Well, yesterday the Office of the Prime Minister sent out a release to make it clear that it's no such thing. The release says, quote, "the…Prime Minister did not request a meeting with the Union leaders as was stated by George Fraser." The release goes unto explain that quote, "in a letter dated January 8, 2014 the Unions' Negotiating Team wrote the Prime Minister asking for a meeting to discuss three areas of concern….the Prime Minister agreed to the meeting on the day suggested by the Unions which is January 30th, 2014." That's Thursday. And after he showed them up, the release ends with a flourish, saying, "The Prime Minister has always treated the unions with the utmost respect and courtesy, accommodating almost every meeting that they have sought, and conducting such meetings on the basis of great civility and cordiality." We're sure they're touched. A huge issue for the Stann Creek teachers, as we showed you, is that their Education Minister, Patrick Faber basically said that they were trying to cheat the children out of a second day of classes this week because they already planned to take tomorrow off, what he called, "breaching the policy of the ministry", to go and collect their pay. His comments suggested mass delinquency on the part of the teachers in that district, that they intentionally skipped work. "Minister is a politician also and we know what politicians do, they twist the truth. One of the things I want to provide Channel 7 with before you leave from here today is a schedule that comes from the Ministry of Education giving rural teachers from Corozal to Toledo time off at the end of the month and some of the have half day, some of them have an entire day. In the Stann Creek District only 8 of our schools that are all the way down south will get tomorrow off. Every other school will be open and classes will take place as usual." "But you what hurts me, when the Prime Minister who said as it pertains to George Fraser - talks about teachers should be telling the truth actually echoed the same sentiment like Minister Faber. I said wow, are they that desperate to make Stann Creek looks bad. Do you always think that this area would be a weak area that you all will always be able to control and divide? One thing with unionism in Dangriga when it comes to BNTU - no politics divide us, no propaganda divide us. We will not be divided and you all tried your very best to tell this country (I want you to say it as it is, don't cut my words) that all my teachers will be taking the entire day off tomorrow when you Patrick Faber, Honorable Patrick Faber knows that is not true. But then again you said some teachers are not good, so maybe a teacher taught you the wrong thing that both of you don't know the difference between one and two, so this is one and this is two and we are not taking two days - we are taking today. You know why we shift? Because the president couldn't be in Dangriga and Toledo at the same time, so we had to come a day earlier and members agreed to make that shift and then go back to classes tomorrow. So deceiving the nation... I am not going to say that it hurts me, it just shows how desperate you all are." "Ma'am, how many schools are there in Stann Creek?" "We have a total of 36 schools in the Stann Creek District and only 8 and I will give you the black and white before you leave to show that I don't have time to be playing games with the minister or with our leader of the country." This evening, she sent us a copy of that list, and we must make a correction to her comments. She said that only 8 of the 32 schools in the Stann Creek District were granted a full day for payday leave. After reviewing the document for ourselves, we found that it was actually 13 of 35 schools which were granted a full day leave. 12 of the remaining 22 get a half day leave, and 10 get no leave at all. Bottom line? 13 schools will get four days off; and 12 will get three and a half days off. "Most of my teachers are not being paid on that last Friday until like after 2-3. Some of them don't see their salaries until Saturday or they go and check and ask for time off and of course you have to fill them for half day to get their business done on Monday. According to the managements, government is not sending the money to them on time. So, tomorrow you will see that same problem again because every last Friday we get a lot of calls. I visited the bank with members and their salaries are not there. It's like the teachers are begging for what is theirs."